Our excursion offers a majestic and unforgettable experience at the Colca Canyon. Come and enjoy it with us. You will travel through impressive landscapes, discover with us the history of villages by visiting pre Inca tombs, sculptures. During this day trip you will have the opportunity to discover different atmospheres as the Colca canyon and the Natural Reserve with its wild life such as vicunas! Early in the morning (around 2:30 a.m), we will pick you up from your hotel and start the trip by a city called Yura. We will direct travel directly to the Cruz Del Condor (approx. 5 hours) and stopping for breakfast. After five hours crossing Peruvian roads we arrive at the Cruz Del Condor where we will appreciate one of the deepest canyons in the world and the Condor sanctuary where you can see at close condors flying on the canyon walls. On the way back, we will stop in the villages of Pinchollo, Maca and Yanque which have beautiful colonial churches; as well as the viewpoints of Antahuilque and Choquetico where we will enjoy pre-Inca tombs and models. 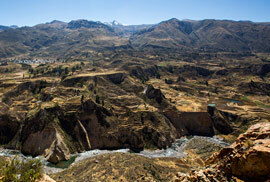 We will enjoy also the beautiful landscapes of the Colca Canyon. Then we will go to Chivay where you will appreciate the hot springs with its warm water to relax. At 12:3 a.m. (approximately) you will have the possibility to have Lunch and start our ride back to Arequipa. On our way back, we will stop at the viewpoint of the volcanoes (highest point 4,910m) in the wetlands of tocra where diversity of birds, herds of llamas and alpacas can be seen. The last stop will be in Pampa Cañahuas where you will observe herds of vicunas (part of the National Reserve of Aguada Blanca and Salinas), the South American camelid beautiful possessor of one of the finest fibers in the world. We will return to Arequipa at approximately 05:00 to 06:00 pm. End of our services.